Wood Frogs are start calling just as soon as the ice is melting off the ponds where they breed. 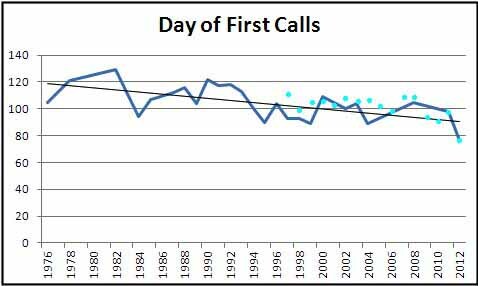 People who keep track of the date of first calling for many years* have noticed a trend toward earlier melts and earlier amphibian calling. The above graph traces (in days after Jan. 1st) the 1st-calling dates for Wood Frogs across 35 years in Peterborough County, Ontario. The 1st-calling dates at Rob Lee’s home, at the northern tip of Lanark County (blue dots), closely parallel the observed trend. Except when snow and ice prevail (typically late November to late March) we routinely encounter amphibians on field trips to our Study Area. Some species practically leap out at us (well, out of our way), but others are very cryptically coloured. Some can be found only by turning the logs or rocks they shelter under by day. In addition, every spring the frogs loudly advertize their presence by calling loudly, often in large, noisy gatherings in their breeding ponds. Within a year of the Macoun Club first entering the Study Area, high-school-aged member Colin Barnard published a bare-bones checklist of its amphibian species in our annual in-house publication, The Little Bear (No. 29, 1971, p.80). Through nearly 40 subsequent years, we have continued to see pretty much these same seven anuran (tailess) and three salamander species. 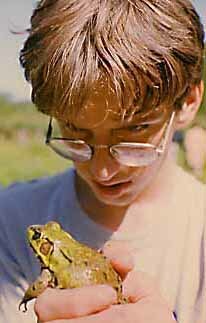 During the Middle 1990s, Macouner William Godsoe was, by his own account, obsessed with amphibians and reptiles. “I took notes on everything! Every field trip was just another opportunity to count and measure all the ‘herps’ I could. I have,” he said, “a card catalogue file full of observations.” It was his intention to write a complete reference to the amphibians of the Study Area, but unfortunately he found himself heading off to university before realizing this ambition. He explained all this in “A Brief Apology” in the Little Bear, before relating some of his by then encyclopedic knowledge of the subject (No. 52, 1998, pages 86-93). Now we’re trying again, pooling our knowledge and drawing on the field notes made available to us all for at least the last five years through our NatureJournal project. You can learn about the biology of these animals elsewhere. 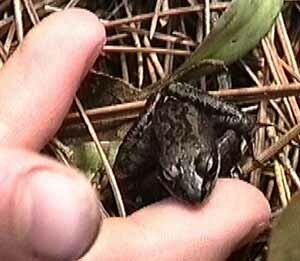 This webpage is about how amphibians use the habitats of our Study Area, and how they behave in our presence. We’ll start with just two species. The tiny Western Chorus Frog (Pseudacris triseriata) is one of the three frog species that emerge from winter hibernation and begin singing when there is still ice lingering on some corner of the pond. The trill of an individual sounds like running your fingernail over a comb, but vigorous choruses probably contain dozens to hundreds of frogs. Their breeding activity can be so intense that they sing all through a few hot mid-April days, as well as the nights. Then they fall silent. We have never found one outside of that narrow period of time. The one shown here had been singing in a shallow spring pond choked with floating sedge leaves, popping its throat out like a big, delicate bubble to make each creaking note. William caught it and set it down on the floor of the adjacent Red Pine plantation for pictures. They sing every year in five of our 23 wetlands, sometimes sharing them with the breeding choruses of Wood Frogs and Spring Peepers. The Eastern Gray Tree Frog (Hyla versicolor) has an amazing ability — it can change colour, from pale gray to bright grass-green, as needed for camouflage. They also have a mottled pattern on the back that is as individual as human fingerprints, allowing you to see that the two pictured here are different individuals. Both were photographed in our Study Area in 1994. The frog on the right was on the sucker sprouting at the base of “Basswood 18*18,” for those who remember the tree. The blackish thing immediately behind it is a frog dropping, which, we have observed, is often left stuck to the branch like this. 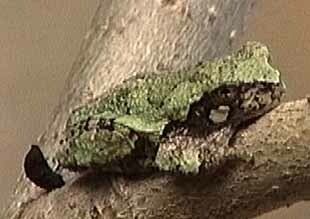 When we find several on one shrub, we know that a Tree Frog is in residence, even if we can’t find it. 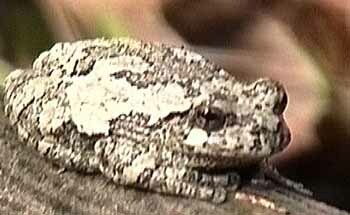 We begin hearing Gray Tree Frogs in April, too, growing louder and sometimes chorusing in May, but not reaching the breeding ponds until early June. Even there, they settle first in the low tree branches and call at eye level, before descending to the water. We reliably find them then in two or three wetlands, but when breeding they seem to call only as night sets in, and we are rarely out then. They could easily be using more ponds than we know of. This species is unique among our local frogs in that it calls loud and long away from the ponds, even by day. To our ears, the calls are the same as in the breeding season. Their trilling sounds so much like the Quirr-rr-rr-rr-rr–rr of Red-Bellied Woodpeckers that many a frustrated birdwatcher has peered up into a single tree for a quarter-hour at a time, convinced there was a feathered creature up there. But if you persist, you may eventually see a big fat Tree Frog crouched on a branch. Its whole body quivers when it calls. Species to be added when the group gets together again: Spring Peeper, Green Frog, Leopard Frog, Wood Frog, American Toad, Blue-spotted Salamander, Red-backed Salamander, and Eastern Newt (Red Eft). * Peterborough data drawn from the Ontario Herpetofaunal Summary database by Mike Oldham, and graphed by Brian Day (both posted to the eastern Ontario Naturelist). Website begun in the Dec. 12th, 2009 Macoun Club meeting; coding revised in 2013 and 2016. All pictures by Macoun members and leaders, past and present.